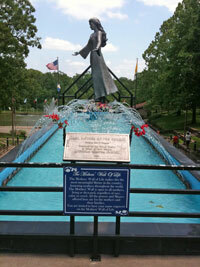 My wife and I did a pilgrimage today to the National Shrine of Mary, Mother of the Church in Laurie, MO. It is a beautiful day for a drive and the Shrine is in great shape. There is a Mother’s Wall on which you can have your Mother’s name inscribed and they will be included in the prayers said for all Mothers. Both of our Mother’s names are on the wall. It is my understanding that during this month of Mary a plenary indulgence can be gained by saying 5 decades of the rosary on the way, 5 decades while at the shrine and 5 decades on the way home. So that’s how we spent part of our day today. I will try to find a source to point you to for this indulgence and add it later. A magnificent Shrine dedicated to Mary, Mother of the Church features an awe inspiring fourteen foot stainless steel sculpture of Mary, which stands in a natural amphitheatre surrounded by beautiful fountains. The Mothers’ Wall of Life has become a great attraction of the Shrine, with the names of mothers from around the world engraved in the polished black granite. The Mothers’ Wall of Life continues to grow daily and is an everlasting tribute to all mothers. The first engraving on the Mothers’ Wall of Life was April 1, 1999. It is a tribute to motherhood and family life, for all mother’s living or deceased, regardless of race, color or creed. There are now 37 states and 13 countries represented on the Wall, making this one of the most meaningful shrines in the country. Go into the web site and search for a loved ones name on the Wall. In 2003, the Shrine became a National Shrine, making this the sixteenth Nation Shrine in the United States, and the only recognized National Shrine in Missouri.